Amidst tumultuous political environments in the US and UK, a simultaneous rise in concern over “implicit bias”, and with global retreat into protectionism and nationalist mindsets, Diageo launched an ambitious project to understand, measure and ultimately influence how “inclusive” people felt toward others. 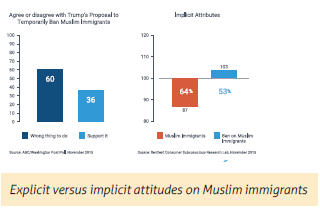 A study by Sentient of 1,007 US voters in November 2015, had revealed that while only 36% of people explicitly admitted that they thought Donald Trump’s proposal to “temporarily ban Muslim immigrants” was the right thing to do, implicitly, 53% of people felt positive emotion toward the proposal, and a full 64% of people carried implicit negative sentiment toward “Muslim Immigrants”. While this evidence of the ability to reveal implicit bias was compelling, Smirnoff had an even broader vision for the research. Rather than focus on people’s feelings of “bias” toward others, Smirnoff reframed the question of implicit bias into one of “inclusivity”. The idea of inclusivity asks a different question from traditional models of prejudice. Rather than asking “How do we prevent and reduce prejudice?” Smirnoff asked “How do we promote inclusivity?”. We began with an exhaustive review of the literature to identify theoretical foundations, and explicit and implicit measures of attitudes and behaviors toward groups (e.g. immigrants, poor people, old people, disabled people). We then ran a pilot study of N=1,279 within the US. The study was replicated in the UK with N=1,389 consumers. Next we moved into our ad-testing phase, using Sentient Subtext™ product that employs eye-tracking, facial coding, Sentient Prime® implicit associations and the Proportion of Emotion consumer choice model to determine ad eff ectiveness. In the US we tested Smirnoff ’s “Deaf Dancer” creative with N=1,595 consumers, to determine ad effectiveness in not only improving demand for the Smirnoff brand, but also in its ability to impact people’s feelings of “inclusivity” toward others. Finally, the ad-testing model was replicated among N=1,618 consumers in the UK, on Smirnoff ’s “Nadia Tehran” ad. The second segment “Excluded Strivers” scored low on “feeling included”, but high on “inclusive lifestyle choices” and moderate on the other measures – indicating that there was motivation, but not full realization of feeling included and including others. The third segment, the “Isolated” scored low on all measures, ultimately feeling neither included, nor motivated to include others. Interestingly, the proportion of the segments showed that less than 50% of the population in both the UK and the US were in the “Inclusive Included” group. the story of Chris Fonseca, and his passion for teaching dance to people who are deaf. Following exposure to the ad, the Proportion of Emotion Model™ revealed a significant lift in demand for the Smirnoff brand (18.7 point emotional preference lift; 90Th percentile within the Sentient Subtext™ ad-testing database). Furthermore, exposure to the spot had an impact on feelings of “inclusivity” among women, with a significant difference in the percent “inclusive included” following exposure to the ad. The integration of multiple methods provided even more value in the form of diagnostics on why we observed an emotional impact from exposure to this ad. Sentient’s Emotional Memory Analysis™ split the facial coding data by the market segments and identified key moments within the ad that resonated emotionally with each group. The same methods were used in evaluating a second piece of Smirnoff creative in the UK. The Smirnoff “Nadia Tehran” spot, improved demand for Smirnoff (2.7 point emotional preference lift), and was effective in changing attitudes of “inclusive socializing”. In the UK, the Sentient Emotional Memory Analysis™ revealed key moments in the ad that worked for some consumers but simultaneously turned off others informing Smirnoff strategy for optimization and buy. The results provide encouraging evidence on many fronts. First, the research lays a foundation for understanding the nature of implicit bias and inclusivity cross-culturally. The expansion of the research into the next seven global markets for Diageo will provide important insight on the state of inclusivity across the globe. Second, the revelation that well executed, and scientifically optimized, communications can have a positive impact on how people implicitly feel toward “others” is welcomed in times of increasing concern and global social withdrawal. Third, the demonstrated ability to simultaneously have a business and social impact with marketing communications should serve as inspiration for all of us in the insights and marketing industries. We can make a real contribution to the world.